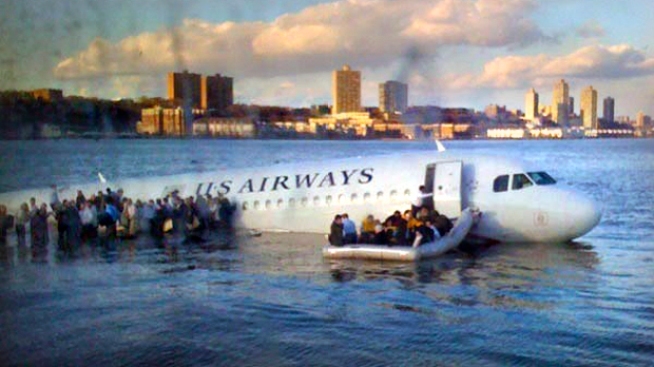 "That Was the Most Perfect Landing I Ever Saw"
Janis Krums from Sarasota, Florida posts the first photo of U.S. Airways flight 1549 on Twitter from his iPhone. "The left engine just blew. Fire, flames were coming out of it and I was looking at it because I was sitting right there. And it just started smelling like gasoline," passenger Jeff Kolodjay said. "...Everyone started, to be honest, to say prayers... Gotta give it to the pilot man. He did a helluva job." "Prepare for impact!" the US Airways pilot told passengers before miraculously landing the Airbus A320. "There were eyewitness reports the plane may have flown into a flock of birds,” said FAA spokeswoman Laura Brown. "I called 911 ... I said, 'I see Port Authority already rushing out to the planes from both sides of the Hudson (River),' within 30 seconds of landing. They were on there way out there. It was unbelievable," a witness told WNBC. “I don't even know how to put it into words right now. I actually grabbed one of the seats, that was the first thing that came to my mind. Some people grabbed the inflatable one. Immediately there were folks coming to us and throwing life jackets to us and helping us get to safety," Alberto Panero told CNN. "There were a couple of people who took charge and started yelling for everyone to calm down. Once people everyone realized we were going to be ok, they settled down." "The first and most important thing is that the pilot did a wonderful job and it would appear that all roughly 155 including crew and one infant got out safely"The most important thing is that the pilot did a wonderful job and it appears that all 155 including crew and one infant got off safely," Mayor Bloomberg said. “We just started taking people from the wing and the inflatable rafts. And we just started giving them clothes and keeping them warm…in less than six or seven minutes we just had five or six boats helping,” said Janis Krums who helped with the rescue. "It looks like a miraculous rescue underway. It was an extraordinary rescue effort," Bill White, of the nearby Intrepid Museum, told NY1. “I saw a plane coming down the Hudson in very controlled fashion but much much lower than it should be. It was really just a remarkable job … it could not appear more controlled or smooth as the pilot touched down in the water,” eyewitness Christian Martin told MSNBC. "I see a commercial airliner coming down, looking like it's landing right in the water. This looked like a controlled descent," Bob Read, who saw it from his office window, told MSNBC. “It made this huge, gigantic splash, and I actually thought it was a boat crash at first. It didn’t occur to me that it was a plane in the water." Fulmer Duckworth, 41 told the New York Times.